Made up of over three hundred islands, Fiji is a haven for conservation, sustainability and refined luxury. Found in the South Pacific, these tropical islands sure know how to draw a crowd. With their azure waters, lush rainforests and warm-hearted communities it makes for a perfect family getaway. 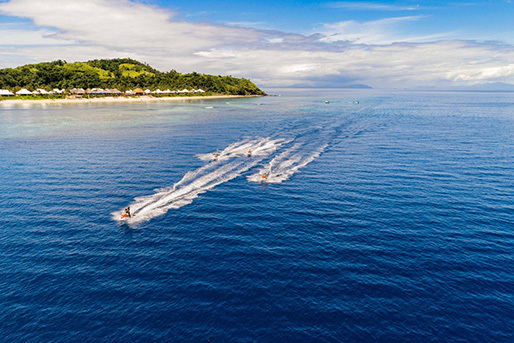 Built on the site of a former coconut plantation, overlooking the turquoise waters of Savusavu Bay, lies five-star luxury eco-resort Jean-Michel Cousteau. The 17-acre resort offers unparalleled views of coral reefs and lush mountains, excitement and undeniable fun. There are twenty-five luxury Fijian bures decorating the shoreline, each more inspiring than the next. From Garden-View bures to the Presidential Villa, the whole family is sure to find their zen. If the accommodation doesn’t make you melt then the spa certainly will. On days where parents need a little “me” time, the Bula Club for Kids is the answer. Send the kids off to explore and enjoy the island activities while you visit the spa and wellness centre for a Nui Health Fiji massage, using coconut oil harvested by the nearby Wailevu Village. With activities like paddle-boarding, snorkelling and hike on hand, parents can kick back and enjoy the sun and sea knowing their children will have the time of their lives. White sand beaches, pristine waters and lush rainforests, Kokomo Island truly is paradise. Australian billionaire Lang Walker has ensured those visiting his $100 million dollar island passion project will want for absolutely nothing… except to stay there forever. A perfect fusion of tradition and modern luxury, the twenty-one gorgeous Beachfront Villas and five Luxury Residences are sure to make you sigh with desire. The Beachfront Villas are staggered across two stretches of white sand beach, consisting of one to three rooms. Tucked away offering an exclusive feel are the “grand” Luxury Residences. Boasting top island views the Luxury Residences are the envy of the island. When it comes to activities they have EVERYTHING on Kokomo including: snorkeling, surfing, diving, paddle-boarding, coral garden restoration, island excursions, yoga, tennis, spa treatments, underwater caves and secret waterfalls… the list never ends. The island offers an infant, a “Kaji” (4-11 years) and a teen club all offering bespoke programs and activities for when parents and children alike want their own adventure. With this much fun on hand it’s no wonder families flock to Kokomo. Adrenaline junky or Zen yogi? Whichever ‘inner you’ chosen to be unleashed on this island holiday, will likely influence your transportation to Sheraton Tokoriki. What will it be… jet ski or catamaran? Located in the Mamanuca islands, Sheraton Resort & Spa boasts unspoiled beauty and world-class service. Vibrant coral reefs, mermaid lagoons and white sanded beaches ready to inspire, there will never be a dull moment on this island. The Tokoriki Island Sheraton Resort & Spa is somewhat bigger than the other island accommodations, with a total of 101 guest rooms and suites. Included in that are thirty Tokoriki Retreats with plunge pools and six Family Suites. The Family Suites offer two rooms – a king and a twin – with the choice of an outdoor plunge pool for extra relaxation or child entertainment. A ‘gold class’ cinema, beach volleyball, coconut husking, cultural lessons, sailing, snorkelling and kayaking are sure to entertain the whole family. If the kids need a little extra entertainment, LaiLai Kids Club offers exciting excursions and activities making the most of the islands beauty, culture and lifestyle.